On February 4, tens of thousands of people protested throughout New Zealand against the formal signing of the US-led Trans-Pacific Partnership (TPP) agreement by representatives from 12 countries. The signing follows years of secret negotiations between the US, Australia, Brunei, Canada, Chile, Japan, Malaysia, Mexico, New Zealand, Peru, Singapore and Vietnam. Approximately 20,000 people marched through Queen Street and thousands rallied outside the SkyCity Casino in Auckland where the deal was signed. Protesters held placards and chanted slogans denouncing the TPP as a power-grab by US-based multinational corporations. The rallies reflected widespread opposition to the TPP in the working class. The agreement will strengthen multinational corporations throughout the Asia-Pacific region, giving them greater power to outsource jobs and attack workers’ conditions. A study published last month by Tufts University researchers estimates that intensified competition under the TPP could cost 450,000 US jobs, 75,000 Japanese jobs, 58,000 Canadian jobs and 5,000 New Zealand jobs by 2025. Under the TPP, companies will be able to sue governments in special investor-state dispute settlement (ISDS) tribunals, if legislation cuts into their profits. Protesters in New Zealand denounced the ISDS clauses as an attack on democracy and a means for corporations to dictate the elimination of environmental and health regulations. Many told reporters that they were concerned the cost of medicines will increase due to stronger patent protections for pharmaceutical companies under the TPP. The agreement will also strengthen intellectual property and copyright laws, potentially restricting access to information and entertainment. Anti-TPP protests in Chile, Peru and Malaysia in recent weeks have also attracted thousands of people. In Lima and Santiago, protesters have highlighted that the TPP will increase the power of US-based agricultural giant Monsanto to impose patents on seeds and drive up food prices and costs for local farmers. The TPP is not a “free trade” agreement. It will create a trade and investment bloc dominated by the US and its main regional ally Japan—the world’s first and third largest economies—covering 40 percent of the global economy. The deal is the economic front of Washington’s strategic “pivot to Asia,” aimed at rolling back China’s economic influence in the Asia-Pacific region. 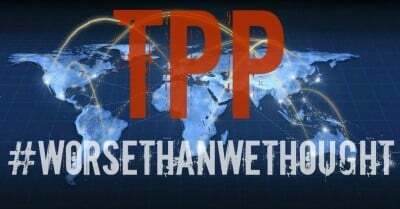 As Barack Obama put it, the TPP will allow “America—and not countries like China—to write the rules of the road in the 21st century.” The agreement goes hand-in-hand with the US military encirclement and preparations for war against China, which has involved strengthening military alliances with countries including Japan, Australia, South Korea and New Zealand. The TPP will only come into force when enabling legislation is passed by each member country. It is unclear when the deal will be passed by the US Congress. If it is not voted on by July, then its ratification will likely be delayed until after the new president takes office next year. The decision to push ahead with the signing reflects Washington’s determination to ram through the deal regardless of opposition within the US. The selection of New Zealand to host the signing of the TPP underscores the country’s integration into Washington’s war plans, despite close economic ties with China. The government is pushing to host a permanent TPP secretariat to help implement the agreement. The New Zealand political parties and trade union bureaucracy which organised the anti-TPP protests under the nationalist slogan “It’s Our Future” have consciously sought to prevent opposition to the agreement from becoming part of a broader movement against austerity and war. While there are divisions in the ruling elite over the TPP, the entire political establishment supports NZ’s alliance with US imperialism. The protest organisers have denounced the TPP as an attack on New Zealand’s national “sovereignty” that favoured overseas businesses at the expense of local ones. They do not speak for the working class but express the interests of less competitive sections of business that fear losing out to global rivals. Such statements promote the lie that New Zealand capitalists and the government are kinder than their foreign counterparts, and that their interests are the same as those of the working class. In reality, thousands of jobs have been shed from the public service and private companies, with the assistance of the trade union bureaucracy, in response to the global economic crisis. These include mass redundancies at the state-owned companies Solid Energy, NZ Post and KiwiRail. The right-wing perspective of the organisers is underscored by the fact that the Maori Party, which represents the indigenous business elite and is a partner in the National Party-led government, has been welcomed at anti-TPP rallies alongside the Labour, Green and Mana Parties. The Maori Party has supported all the National government’s austerity measures and attacks on the working class over the past eight years. It fears that the TPP will cut across the close relationship between the government and Maori tribal-based businesses. The anti-immigrant New Zealand First Party also had a significant presence at the protests. Along with Labour and the Mana Party, NZ First has repeatedly scapegoated Chinese immigrants and investors for New Zealand’s social crisis, including soaring housing costs. The xenophobic campaigns have served to align the country more closely with the US build-up to war. One of Labour’s main objections to the TPP is that it will prevent future governments from banning house sales to foreigners. The Labour Party is divided over the TPP, with three former leaders—David Shearer, Phil Goff and former Prime Minister Helen Clark—supporting the deal. Current leader Andrew Little admitted to Radio Live on February 5 that Labour would seek to renegotiate aspects of the TPP but would not pull out of the agreement if it wins next year’s election.